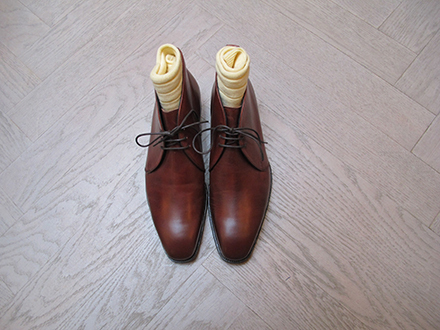 Recently we collaborated with our favourite shoe maker G. J. Cleverley creating two styles exclusively for Anderson and Sheppard. A chiselled toe, fiddle shaped , laced ankle boot available in both horse chestnut and mid-brown leather and mole coloured suede. 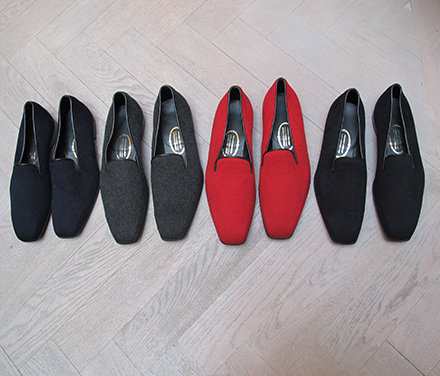 The second style, a Loro Piana cashmere slipper with a gently rounded chiselled toe in black, navy, red and charcoal grey. Many thanks to both George Glasgow Senior and George Glasgow Junior at Cleverley.